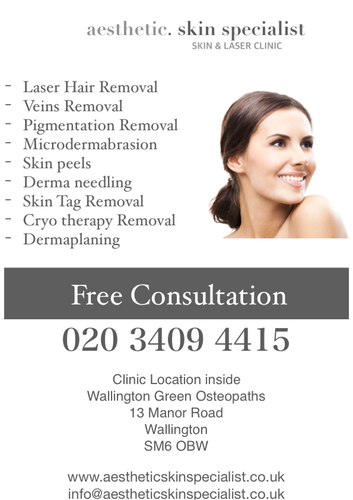 Located inside Wallington Green Osteopaths established from 2007, in the heart of Wallington green area, yet in very private and clinical surroundings. At Aesthetic Skin Specialist our laser treatments are delivered by highly qualified and experienced aesthetic practitioners, using the most advanced medical-grade, FDA-approved laser. We are passionate about delivering an outstanding patient experience, offering treatments that have been proven to achieve the best results. We believe our personal care is unrivalled; we aim for complete customer satisfaction, making sure that all of the services we offer provide clients with the best outcome. Our ethos is the customer comes first and so we provide FREE CONSULTATION so that you can make up your own � mind as to whether our treatments are right for you. 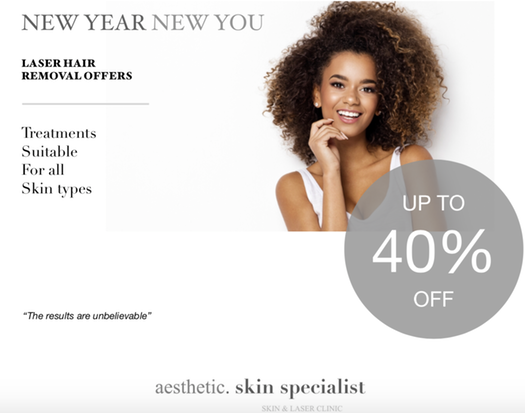 Aesthetic skin specialist is a small, friendly, yet professional clinic, and we were established in 2018 by Senior aesthetician Erica Caballero.We are not part of a large corporate chain but prefer a more intimate and consistent approach with�clients seeing the same Aesthetician from start to finish. Located in Room 3 of the practice, Erica has many years of experience in the laser skin care industry as a Senior Aesthetician. We uses only the best Cynosure Elite Gold Standard FDA approved laser machine as used in Harley Street and other top London Clinics. Erica takes pride in offering high standard safe treatments using sophisticated laser technology. Wallington Green Osteopaths opened in 2007. We are a friendly and caring team and have been serving the local community for over ten years, many of our patients are recommended by friends and family.